This weekend there is a Medieval Festival taking place in the nearby market town of Tewkesbury. It is an annual event which commemorates the Battle of Tewkesbury which took place here on 4th May 1471. The main event is a very realistic re-enactment of the battle on the actual site. Also in Tewkesbury Abbey high up on the ceiling there is a magnificent Red Rose carved, which shows the badge of Edward 1V, the ‘sun in splendour’. Fittingly, both the victor and the vanquished are remembered in the Abbey. They are also remembered by an impressive sculpture, which was installed on the Stonehills Roundabout at the Tewkesbury end of the A38 road to Gloucester last year. 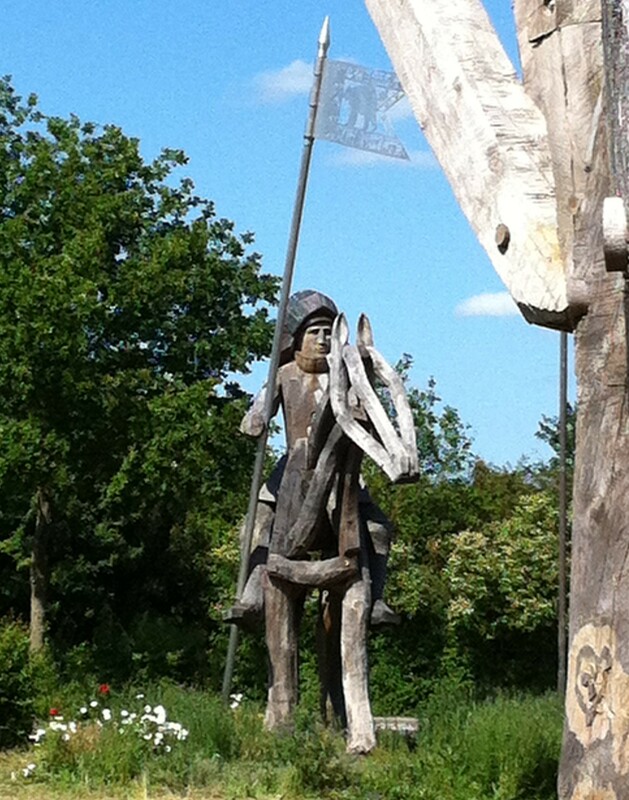 The sculpture is called ‘Arrivall’ and consists of two timber framed horses 5m (16ft) tall. One is a mounted knight, known as Victor, which is a symbol of the victorious Yorkist forces of King Edward IV. On the opposite side of the roundabout stands the other sculpture, the riderless horse Vanquished, which is a symbol of the beaten Lancastrian forces. His head is bowed in defeat and exhaustion from the battle. The sculptures, made by Phil Bews from the Forest of Dean are of green oak, and the work took 2 years to complete. Local schoolchildren and members of the community were invited to carve poppies on the horses’ legs in remembrance of the centenary of WW1 in 2014. Both of the horses have lances with pennants which swing in the breeze. These were made by a local company and donated free. In fact the local people and business community raised almost all the £65,000 needed for this magnificent sculpture, which rather eerily faces the original battle site. I took my life in my hands on this busy roundabout to get some photos. I am looking forward to going back and getting more photos at different times of the year and in different weather conditions, at sunset and in moonlight. But even in daylight I found the sculptures very impressive and strangely moving.